It is interesting that the same man who brought an end to strife in Little Rock’s divided government in the post-Civil War era would then be active in a major rift in the Arkansas state government only a couple of years later. But that is just what Robert F. Catterson did. On March 22, 1835, future Little Rock Mayor Robert Francis Catterson was born in Indiana, the son of Irish immigrants. He studied medicine in Ohio and established a medical practice in Indiana upon completion of his studies. With the outbreak of the Civil War, he enlisted as a private in the Union Army. Throughout the war, he was promoted and was eventually mustered out as a brigadier general in 1866. During his service, he participated in the siege of Vicksburg, the Battle of Chattanooga, the Atlanta Campaign and Sherman’s March to the Sea. Following his departure from the military, Catterson decided not to return to medical practice. He moved to Arkansas and worked for a brief time in the cotton commodities field. He later returned to military service commanding a militia fighting the Ku Klux Klan. Catterson was appointed US Marshal. In November 1871, he was elected Mayor of Little Rock. His election ended a tumultuous two-year period where the Little Rock City Council tried unsuccessfully to remove Mayor A. K. Hartman. Mayor Catterson served a relatively quiet two year term in office until November 1873. A few months after leaving office, Catterson would return to “military” service as he commanded the troops who were supporting Joseph Brooks as he wrested control for several weeks from Governor Elisha Baxter. Sometime after order had been restored, along with the return of Governor Baxter to the statehouse, Catterson moved to Minnesota. He later moved to Texas where he died on March 30, 1914 at the age of 79. He is buried in the San Antonio National Cemetery. For the two years leading up to the November 1871 election for Little Rock mayor, the political scene had been chaotic. A. K. Hartman, who represented one faction of the Republican Party, was so disliked by the LR City Council that they repeatedly tried to have him removed from office. After being rebuffed by the courts, the aldermen proceeded to simply appoint another mayor of Little Rock. Thus from January 1871 to November 1871, Little Rock had two mayors: A. K. Hartman, and J. G. Botsford. After having been elected first in January 1869 and re-elected, Hartman (whom the Gazette disliked and derogatorily nicknamed “Count Von Bismark” on account of his Germanic heritage and his corpulence) was seeking another term in November 1871. Thomas C Scott announced, in October 1871, that he would seek the office as an independent, but withdrew a few weeks later. The only person who stood between Hartman and re-election was Dr. Robert Francis Catterson. A few nights before the election, approximately 500 of Catterson’s supporters paraded through Little Rock with signs bearing anti-Hartman slogans and caricatures. They stopped off to hear an address by Mr. Brooks. On election day, Catterson and his allies swept most of the City offices. He bested Hartman by a vote of 710 to 374 and carried three of the city’s four wards. He served in office until November 1873. On the morning of May 19, 1874, Joseph Brooks cleaned out his belongings from the gubernatorial office in the 1842 Arkansas State Capitol (now the Old State House) and disappeared to points unknown. The beginning of the end of his stint claiming to be Arkansas Governor came on May 15 when President US Grant accepted the recommendation of his Attorney General that found Elisha Baxter was the duly elected Governor of Arkansas. Following Brooks’s departure, the grounds and building were in shambles. A Gazette reporter noted that barricades had been built on the lawn of the building. The front and back doors remained, but their facings had been removed to make it easier to roll big weapons and equipment in and out of the building. In preparation for the return of Gov. Baxter, crews were busy trying to restore order in the building. The Senate Chambers were nearly put back in order that day, but the House Chambers needed more attention. As another illustration of the disarray in state government between April 15 and May 19, the state treasurer, Henry Page, told the newspaper that he had not cut a single check at the request of the Brooks administration. He stated that he had not denied the request, he just delayed responding to it. Finally that day, Governor Baxter arrived at the head of a ceremonial parade of carriages. Among those who accompanied the governor was Arkansas Gazette founder William Woodruff. In the next carriage, future US Senator and Attorney General Augustus Garland sat with reporters from the New York Times and Arkansas Gazette. Upon arriving at the Capitol grounds, Baxter delivered a speech. 101 guns were fired in salute to him. The cannon on the capitol grounds (nicknamed Old Lady Baxter) was shot off several times. A retinue of Little Rock’s ladies pulled the lanyard to detonate the cannon. As part of President Grant’s order to end the Brooks-Baxter War, the ground was laid for a new Arkansas Constitution, the end of Reconstruction, and the re-enfranchisement of Democratic voters. In short order, the 1874 constitution, under which Arkansas still operates, was adopted. Many of the Republicans and African American office holders soon found themselves out of power. And African Americans were completely disenfranchised. It would be 92 years before Arkansas would again elect a Republican to be Governor. The adoption of the new constitution took the term of governor and other constitutional officers from four years to two years. In 1874, he retired to Batesville and lived there until his death in 1899. Brooks remained in Little Rock until his death in 1877. Today (March 10) at noon, Blake Wintory presents the Old State House’s March Brown Bag program on the life of Edward Allen Fulton. Fulton was an African American leader, politician and newspaper editor in Arkansas during Reconstruction and subsequent years. Born a slave in Kentucky in 1833, Fulton spent his youth as a slave in Missouri before escaping and joining the abolitionist movement in Chicago. During the Civil War he worked as a recruiter for U.S. Colored Troops and arrived in post-war Arkansas in 1866. In 1870 Drew County elected him to the Arkansas General Assembly as a Republican. Fulton sided with Joseph Brooks’ “Brindletail” or Reform Republicans and often clashed with the Regular Republicans, including Governor Powell Clayton. Throughout his career he championed the rights of African Americans and even led several Drew County families to western Iowa at the height of the Exoduster migration. Despite a colorful life that included an assassination attempt, Fulton died in relative obscurity in St. Louis in 1906. Blake Wintory received his Ph.D. from the University of Arkansas in 2005. He is the on-site director at the 1859 Lakeport Plantation, an Arkansas State University Heritage Site in Chicot County. He serves on the board of Preserve Arkansas and the Friends of the Arkansas History Commission. In 2015 he published his first book, Images of Chicot County, and has published articles on Arkansas history in the Arkansas Historical Quarterly, the Arkansas Review, and the Encyclopedia of Arkansas History & Culture. On this date in 1835, future Little Rock Mayor Robert Francis Catterson was born in Indiana, the son of Irish immigrants. He studied medicine in Ohio and established a medical practice in Indiana upon completion of his studies. Following his departure from the military, Catterson decided not to return to medical practice. He moved to Arkansas and worked for a brief time in the cotton commodities field. He later returned to military service commanding a militia fighting the Ku Klux Klan. 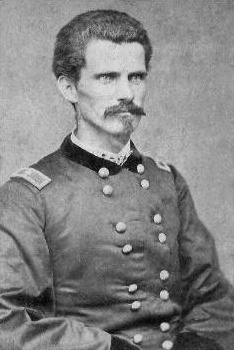 Catterson was appointed US Marshal and would also command the Brooks troops during the Brooks-Baxter War in Little Rock. Following the completion of his term, Mayor Catterson moved to Minnesota. He later moved to Texas where he died on March 30, 1914 at the age of 79. He is buried in the San Antonio National Cemetery.